Take Current Affairs quiz February 25, 2019 to enhance your General Awareness. Practice with our esteemed Current Affairs quiz February 25, 2019 questions which covers all important events across India as well as World. Make use of all important Current Affairs quiz February 25, 2019 questions with answers updated here, at free of cost to succeed in all competitive Exams and Interviews. Which of the following app did the Election Commission of India develop for the Lok Sabha election 2019? Which of the Capital markets regulator barred Motilal Oswal Commodities Broker and India Infoline Commodities (IICL)? The Securities and Exchange Board of India (SEBI) has declared Motilal Oswal Commodities Broker and India Infoline Commodities (IICL) unfit to function as commodity brokers on account of their alleged role in the Rs.5,600 crore settlement scam at the National Spot Exchange Ltd (NSEL) that came out in the open in July 2013. Which of the following military exercise is hosted by US and Thailand? The annual Cobra Gold military exercise was hosted by Thailand and the United States. Where was the Cobra military exercise held? Cobra Gold military exercise was held in Thailand. Which of the following scheme did the Madhya Pradesh government launch to guarantees 100 days of employment to urban youth? The Madhya Pradesh government launched its flagship scheme ‘Mukhyamantri Yuva Swabhiman Yojana’. This scheme guarantees 100 days of employment every year to urban youth from economically weaker sections. Which state government recently launched boat ambulance service for remote areas at the cost of around ₹5.40 crore? Naveen Patnaik-led Odisha government has launched a boat ambulance service to ferry patients to hospitals in remote areas. The project costs around ₹5.40 crore. Who made his T20 International debut for India against Australia on February 24, 2019? Mayank Markande made his senior Team India debut in the first Twenty20 International against Australia in Visakhapatnam. The 21-year-old spinner Markande hence became the 79th player to represent India in the shortest format of the game. Government increased Risk and Hardship Allowance for CAPF personnel from ₹9,700 to ________ per month for those up to the Inspector rank. The Ministry of Home Affairs increased the Risk and Hardship Allowance for CAPF (Central Armed Police Forces) personnel from ₹9,700 to ₹17,300 per month for those up to the Inspector rank. For those above Inspector rank, allowance was increased from ₹16,900 to ₹25,000. Scientists have discovered 300,000 new galaxies using a Low-Frequency Array (LOFAR) telescope. SpaceX launched Israel’s first moon lander Beresheet from Florida. Merger of Vijaya Bank and Dena Bank with BoB (Bank of Baroda) to be effective from April. Which of the following scheme did the Maharashtra government launch to guarantees 100 days of employment to urban youth? The Madhya Pradesh government launched its flagship scheme ‘Mukhyamantri Yuva Swabhiman Yojana’. It was launched by the Chief Minister Kamal Nath. This scheme guarantees 100 days of employment every year to urban youth from Economically Weaker Sections (EWS). Who has been appointed as Saudi Arabia’s first female ambassador to United States? Saudi Arabia has appointed Princess Reema bint Bandar, a former business executive and philanthropist, as its first female ambassador to the United States. Which of the following Indian Shooter claimed gold medal with a world record score of 245 in ISSF World Cup? The 16-year-old Indian Shooter Saurabh Chaudhary claimed gold medal in the men's 10m air pistol event with a world record score of 245.0 in the final at the season-opening International Shooting Sport Federation (ISSF) event. In addition, he sealed a berth for the 2020 Tokyo Olympics. GST on under construction houses cut from 12% to _______%. The GST Council announced under construction properties priced over ₹45 lakh will invite 5% GST, instead of 12%. A residential property priced at ₹45 lakh or below will now be defined as "affordable" and taxed at 1%, from 8% earlier. --------- became First Indian Woman to receive Future of Nature Award? Divya Karnad became First Indian Woman to receive Future of Nature Award. Kareena Kapoor Khan named brand ambassador of Swasth Immunised India. Who won Best Actress award at Oscar 2019? Olivia Colman has won the Oscar for best actress for The Favourite. Rami Malek scooped the best actor gong. Which of the following film won Oscar 2019 Best Foreign Film? Alfonso Cuarón’s “Roma” won the Oscar for Best Foreign Language Film. “Roma” was the eighth film from Mexico nominated for Best Foreign Language Film, and the first to win. 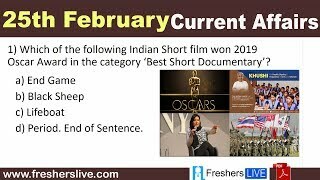 Which of the following Indian Short film won 2019 Oscar Award in the category ‘Best Short Documentary’? India-based short film on menstruation, titled 'Period. End of Sentence.' has won the Oscar 2019 for Best Documentary Short Subject. Jindal Steel and Power Ltd won the FICCI CSR Award for Women Empowerment. Reserve Bank of India bundles NBFCs into a single type to offer operational flexibility. Which state approved Rs 466 Crore Sanitary Napkin Scheme for adolescent girls? Odisha approved Rs 466 Crore Sanitary Napkin Scheme for adolescent girls. Are you looking for right place to enhance your Knowledge on Current Affairs of 25th February 2019 through effective Quiz section? FreshersLive grants you the advantageous Current Affairs Quiz questions with accurate answers for 25th February 2019 which covers all the important events, supreme Awards, major occurrences in the National as well as World level. All important Current Affairs Quiz questions of 25th February 2019 are updated instantly in this page. Everyday at least 25+ Current Affairs Quiz Questions are displayed in this FreshersLive page. Correct Answer for each quiz question is given at the end of the entire 25th February 2019 Current Affairs Quiz questions section. You can estimate and upgrade your GK by attending these useful quiz questions. Entire quiz questions of 25th February 2019 Current Affairs covers Competitive Exam as well as Interview point of essentially important topics like International News, National News (ie. Indian Affairs), Science & Technology News, Environmental News, Bills & Acts Passed by Government, Defence News, About important Persons, Places, Banking & Economical News, Awards & Honours, Sports News, Revolutionary Updates on Arts & Culture, Obituary, Summits & Conference, Important Committee, Schemes, Appointments, Important Days & its Theme for Current as well as upcoming Year, Books & Its Authors, Agreements & MoUs, Budget, Taxes, Various Important Lists & Indexes, Visits by World Presidents, Prime Ministers, Political affairs and all Current Events. 25th February 2019 Current Affairs Quiz Questions updated in this page are prepared in the sense to help all aspirants to succeed in various Competitive Exams like UPSC IAS and other Civil Services Examination, Various Bank exams like IBPS PO, IBPS Clerk, SBI PO, SBI Clerk, RRB PO, RRB Assistant, Insurance exams like LIC AAO, UIIC Assistant, Railway Exams, Various Central Government Exams like SSC CGL, SSC CHSL, and more. Attempt all the Current Affairs Quiz Questions of 25th February 2019 and evaluate your score by matching your response with the correct answers mentioned at the end of this quiz questions section. By practising the FreshersLive Current Affairs Quiz Questions on a daily basis, you can surely succeed in the competitive exams as well as the interviews easily. Make use of this ultimate resource to the fullest and quickly achieve your goal!